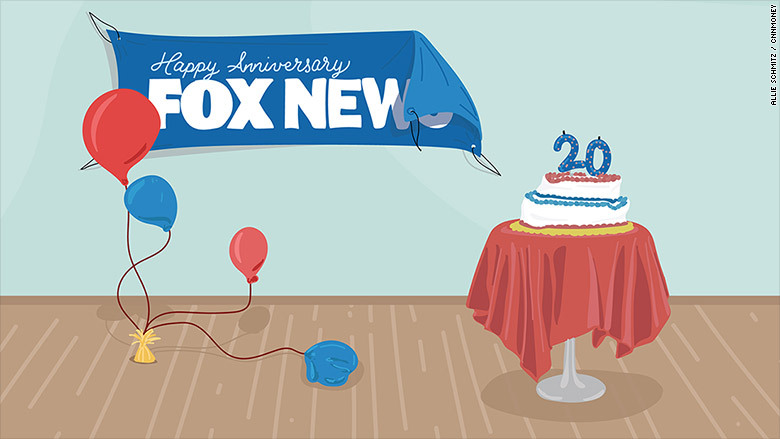 Friday marks the 20th anniversary of Fox News. But the channel is not holding a blowout birthday party. The celebration is tempered in large part by Roger Ailes' recent resignation and undeniable uncertainty about the future of the top-rated cable news channel. The demands of campaign coverage and the sudden concerns about Hurricane Matthew are also factors. Fox is noting the anniversary in small ways, however, by showing TV clips from its archives and changing its logo to say "20th." "I look back at what we have accomplished and I couldn't be more proud," 21st Century Fox patriarch Rupert Murdoch said in a Friday morning memo. "We have changed the face of television news and the industry at large." That is true. Critics charge that Fox changed media for the worse, creating a conservative echo chamber and causing increased political polarization. The channel's fans say it brought badly needed diversity to the television business. At Fox News headquarters on Friday, Ailes' replacements Bill Shine and Jack Abernethy (who became co-presidents back in August) spoke with staffers inside a brand-new studio that will officially open on election night. There will be complimentary lunch and dinner spreads in the newsroom. But Fox made a much bigger deal of its 15th anniversary, back in 2011, including a huge party at Chelsea Piers in New York City and a cross-country tour by its hosts. Since then -- actually, just in the past few months -- so much has changed. Ailes, the founding father of Fox News, resigned in July after being sued by ex-anchor Gretchen Carlson. The lawsuit alleging sexual harassment and retaliation prompted an internal investigation by 21st Century Fox and a litany of similar accusations from other women. Ailes denied the allegations, but decided to step down under pressure from the Murdochs. Now there are swirling questions about what will change at a post-Ailes Fox. Already, another longtime host, Greta Van Susteren, has left the channel; she took advantage of a clause in her contract allowing her to leave if Ailes left. 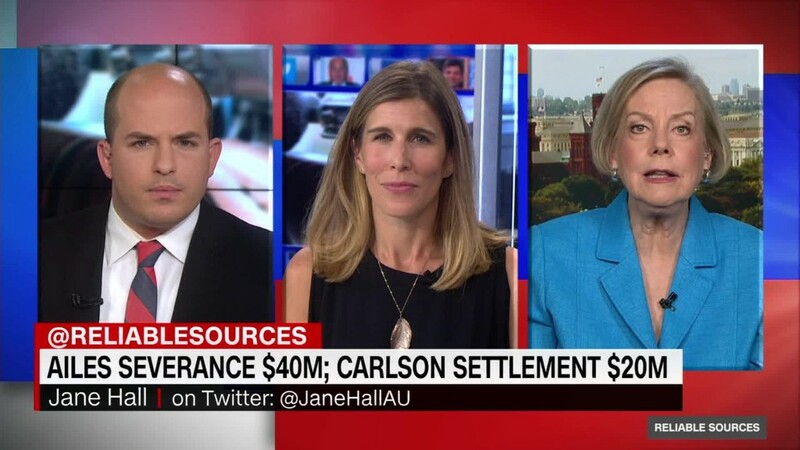 She was swiftly replaced by Brit Hume, but only through the election. Shine and Abernethy have to decide what to do with Hume's 7 p.m. time slot, Carlson's 2 p.m. time slot and potentially several other hours of the programming day. Two of the channel's biggest stars, 8 p.m. host Bill O'Reilly and 9 p.m. host Megyn Kelly, have contracts coming due in 2017. This week the executives faced bruising stories and a protest outside the HQ about an offensive "O'Reilly Factor" segment that mocked Asian Americans. And they had to contend with an unusual public tiff between Kelly and 10 p.m. host Sean Hannity. On Thursday night Kelly and Hannity tweeted a picture together and said they are friends. "We're Irish. It's complicated," they said. During the celebratory meeting in the new studio on Friday, Shine and Abernethy made light of the recent drama. "Now you may ask yourself how this is going to work -- Jack and I are good friends and we're both Irish..." Shine said. "So it's complicated," Abernethy quipped. Then the two men turned more serious. "Today is about looking back at 20 news-packed years and then looking ahead to doing even more journalism," Shine said. He also acknowledged some longstanding complaints from staffers about what he called "a lack of communication from the top." "Jack and I are set to fix that," he said. Abernethy congratulated the roughly 190 people who have worked at Fox News since the "very beginning" in 1996. Fox remains No. 1 in both total viewers and in the key advertising demographic of viewers ages 25 to 54. "It's the same as in sports. You put together a good team and the team performs," Bill O'Reilly said during a retrospective segment on "Fox & Friends" Friday morning. But Fox's advantage in the so-called "demo" has been shrinking amid stiff competition from CNN and MSNBC. More than half of Fox's profits come from subscriber fees from cable and satellite providers. Those fees are set for several years to come, ensuring a profitable 25th anniversary for the network. But the challenge Fox faces -- amid an all-out civil war in the GOP -- is to retain its formidable grip on conservatives. The channel's executives also recognize an urgent need to expand Fox's digital footprint. While Ailes was a masterful television producer, he had little interest in FoxNews.com and social media. Abernethy told staffers on Friday that "we have a plan in place to upgrade FOXNews.com and our other digital ventures."